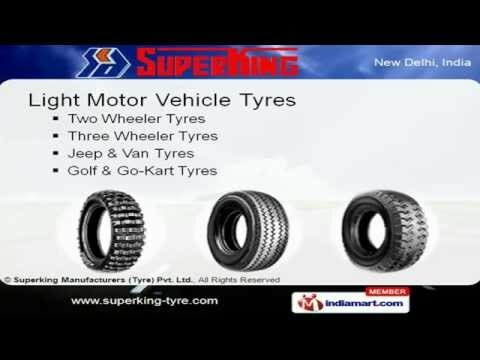 Welcome to Superking Manufacturer & Exporter of Automobile Tyres We are an ISO 9001:2000 certified company and a govt of India recognized Star Export House, established in the year 1982.Latest technology, Adequate equipments, Intensive research & Cosmetic touch has helped SUPERKING to find a place of recognition. We offer a diverse range of OTR, Industrial, Agriculture Tractor & Light Motor Vehicle Tyres. Our Agriculture Tractor Tyres are widely appreciated in the market.We offer tyres for Jeep, Van, Golf & Go-Kart under Light Motor Vehicle Tyres.Our Industrial Tyres have excellent resistance towards tearing and cracking.We offer a comprehensive range of OTR tyres, which is suitable to carry out heavy-duty works. Along with that we offer Agriculture & Flotation Implement Tyres that are long lasting and highly dependable.